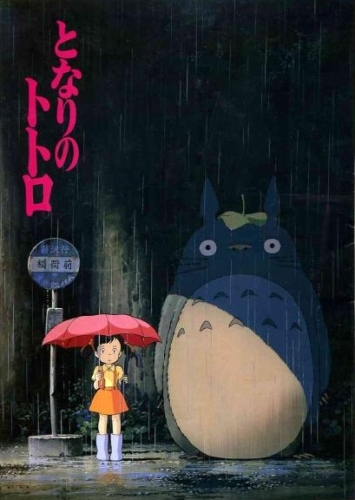 My Neighbor Totoro is probably Hayao Miyazaki's most famous film, although it's from 1988 and not as fascinating as his contemporary works. There's less action, less visual and aural spectacle, and a much simpler and shallow story. But it's also an amazing children's tale that you can still enjoy as an adult and it contains universal appeal. Basically it's a great movie that everyone will like and be willing to watch multiple times. The film centers around 11-year-old Satsuki and her younger sister Mei after moving to the countryside with their father. Their mother is in the hospital with some sort of chronic illness that is never fully explained. The entire film is presented from the viewpoint of someone of Satsuki and Mei's ages, which means the world appears simple in some ways, grand in others, and magical but overwhelming. Totoro is a forest spirit that appears to Mei and then Satsuki. He lives in the enormous tree at the nearby temple. I really liked this film. It's endearing, fun, and magical just like Satsuki and Mei. The songs have a sing-along quality to them, and the art is colorful and vibrant. The English ADR is pretty good as well since it was done by Disney. There aren't any deep thoughts or epic conflicts here; it's more like the type of movie you'd watch on a lazy Sunday afternoon.